The lilium genus, surprisingly, is only indigenous to the temperate zones of the Northern Hemisphere, but it has been so popular for so many centuries that it is worldwide in distribution. There are many, many species native to North America, Asia and Europe. 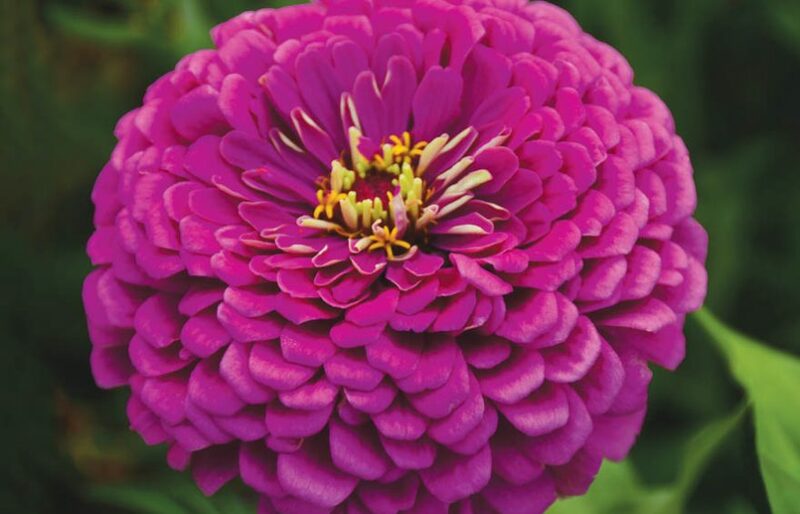 Flowers are of many different sizes and shapes – some highly fragrant, some not. 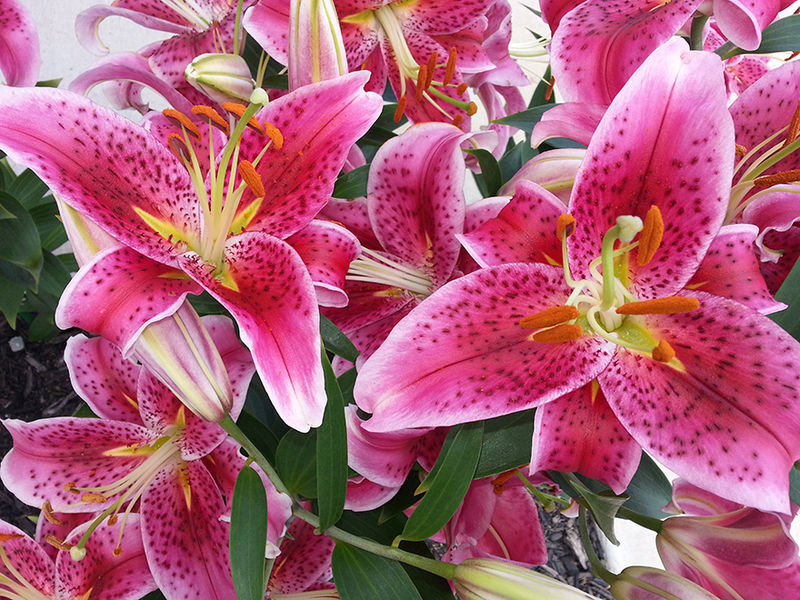 Lilies were a part of the Greek and Roman civilizations. New World lilies and the lilies of China and Japan were quickly and eagerly embraced by Europeans and the British. 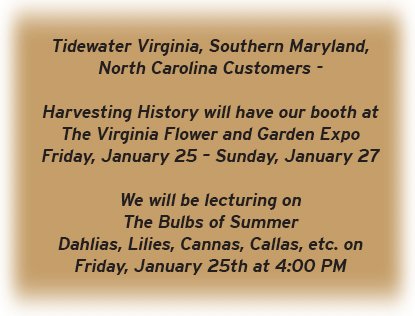 Since the Renaissance, the development and cultivation of lily cultivars has proliferated, but it was not until the late 1800s that the most significant lily introductions were created. E. H. Wilson (1876-1931), the Director of The Arnold Arboretum outside of Boston, MA introduced L. davidii, L. regale,and L. sargentiae. These three lily species became the most important lilies of the 20th century. Asiatic and Oriental lilies are often very similar in appearance and many astute and experienced gardeners see no difference in the two. However, there are differences and these can be substantial. Oriental lily plants grow taller than Asiatics. The flowers can be heavily fragrant and are usually much larger than the Asiatic blossoms. 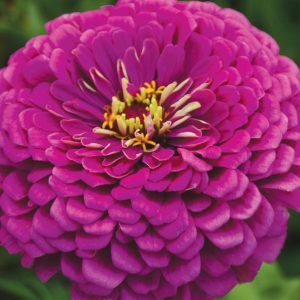 Orientals bloom much later than Asiatics so it is best to plant both Asiatics and Orientals for continuous blooms from early summer to fall. Oriental lilies can be planted in the fall or the spring. If planting in the fall make sure the location does not become soaking wet in the winter or the bulbs will rot. Lilies can be planted in the spring as soon as the ground can be worked and up until mid-June. Lilies planted after mid-June may not bloom the first year. 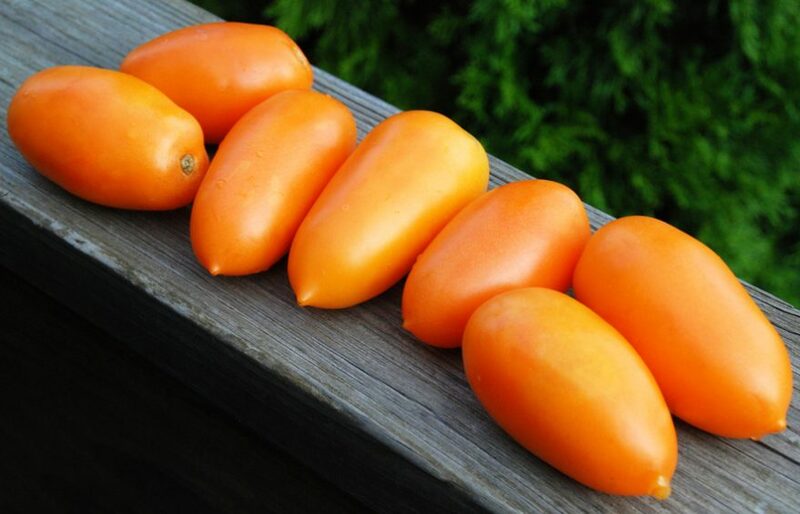 Plant the bulbs in organically rich soil amended with bone meal. 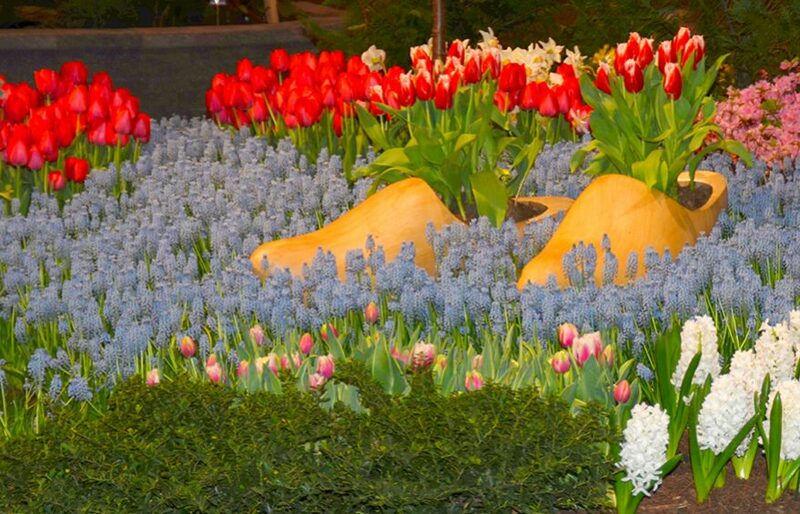 Keep the soil moist, but do not allow the bulbs to stand in water. Plant the bulbs 6 inches apart and at least 6 inches deep. 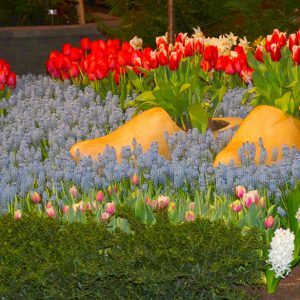 In Hardiness Zones 1-4, planting the bulbs 8 inches deep is recommended. Twice a year, mix some coffee grounds (1/4-1/2 cup) into the surface soil around the plants. Lilies like a slightly acid soil andthe coffee grounds will help. Robert Swanson is an Oriental Trumpet lily. Oriental Trumpet lilies are the tallest of the Orientals, sometimes reaching a height of 6 feet, and they produce the largest blossoms. 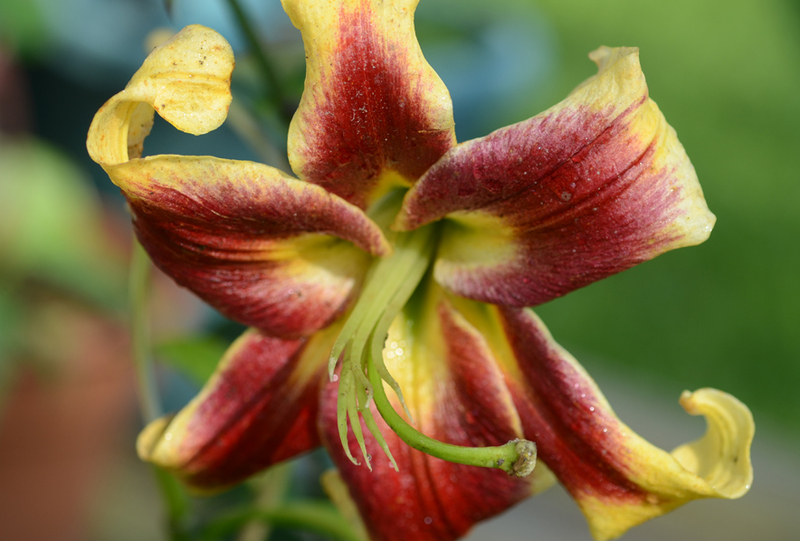 This lily is the rarest of the lily colors, bright yellow with a red-rust colored throat. It routinely reaches a height of 44-48 inches. It was named for the man who founded Genentech – the company which was the first to successfully sequence the human genome. Dizzy is a wonderfully playful addition to the garden. The vivid rose-red striping at the center of each petal and the sweet, little red freckles combine to make the Dizzy blossoms delightful. The plants reach a height of 40-44 inches and produce 3-4 flowers in the first year and 4-6 flowers in subsequent years. 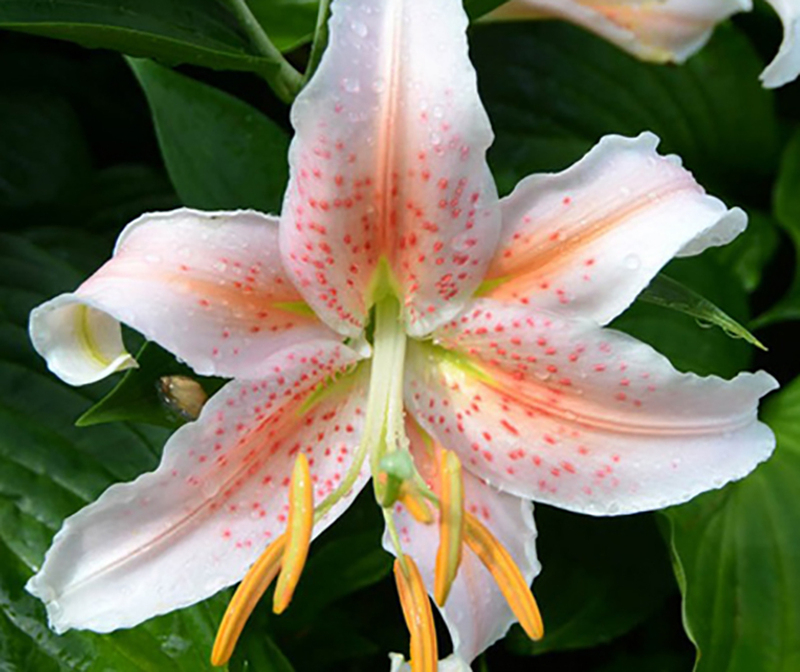 Stargazer, along with Casa Blanca, are arguably the most famous lilies of all time. 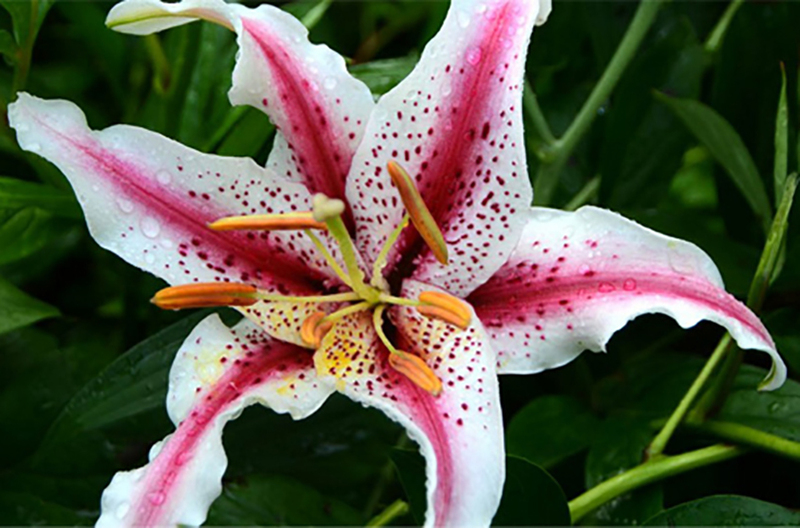 Surprisingly, Stargazer is a relatively new addition to the lily family having been introduced in 1974. 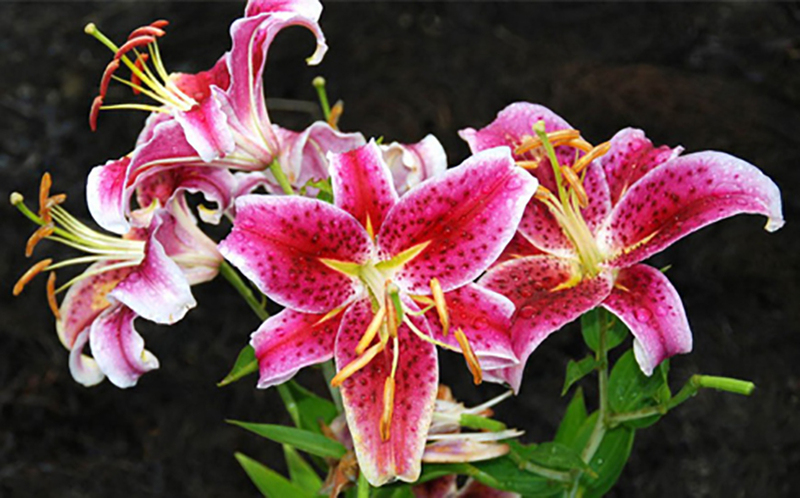 This lily produces an abundance of blossoms (6-10 per plant in 2-3 years), but it is its unforgettable fragrance that has made this plant so popular. You will know the minute it has bloomed, because a sweet, gentle perfume will waft its way through the open windows in your home. The blossoms will last from 1-3 weeks depending on the weather. 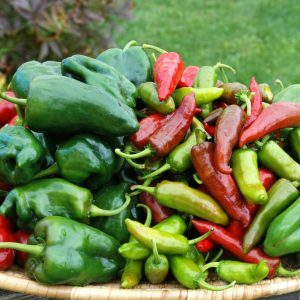 In the first year, the plants will reach a height of 30-36 inches, but in subsequent years the plants will grow to 40-44 inches. On this one, I have a confession to make. Salmon Star is my favorite lily. I grew it for the first time about 10 years ago in order to take photos for our website. I had absolutely no interest in growing a salmon pink lily in my garden, but then it bloomed. The color of the blossoms was so unique and so stunning I could not stop looking at it. The plant was located where I park my truck and everyday I would jump out of the truck and go to look at the blossom. 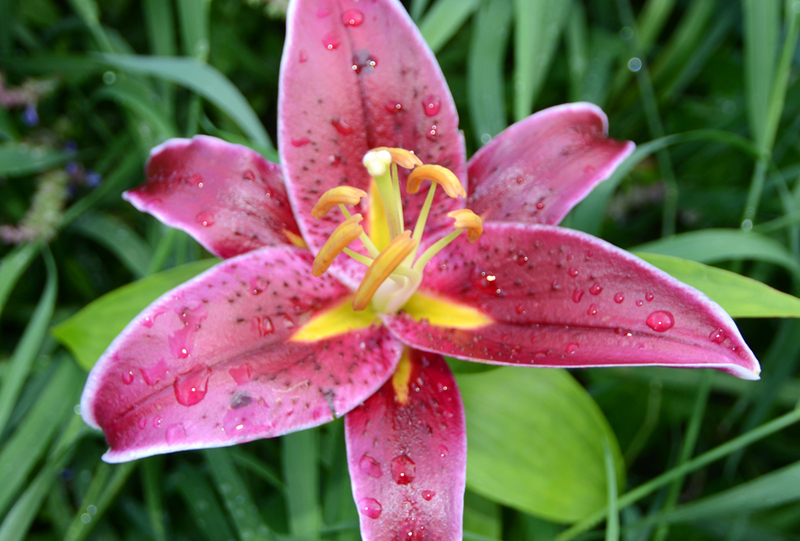 Salmon Star is a smallish Oriental lily. It only reaches a fully mature height of 3 feet and in its first year may only grow to 2 feet in height. 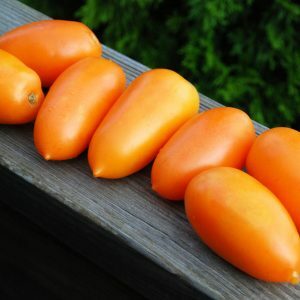 It produces 3-5 blossoms at the most, so I would plant 2-4 bulbs. It has a very slight fragrance, but you are not growing this lily for its fragrance. You are growing this lily for its incredible color. Oriental lilies do well in containers, but in Hardiness Zones 1-3 and sometimes 4, the pots should be sheltered in the winter – an unheated garage or shed will do. Lilies need to experience a period of cold, at least 8-10 weeks, but may not survive temperatures that dip into the minus 20s and minus 30s. One lily in a 10-12 inch diameter, deep (8-12 inches) pot is optimum. Mix 1/2cup of bone meal in the potting soil you use and repeat this annually. Lilies like a slightly acid soil, so add a 1/4 cup of coffee grounds to the pot twice ayear – once in the early spring and once in the late fall. The absolutely best soil mix for containers is 60% crummy backyard soil,20% peat moss and 20% dehydrated cow manure or, even better, compost. If you blatantly refuse to use backyard soil then purchase topsoil (not potting soil, special soil mixes, premium soil). Mix the ingredients together and pour into a pot. Magny Course makes an excellent container plant because, compared with most Oriental lilies, it is quite short. It usually reaches a height of no more than 18 inches, but it produces an abundance (3-6) of intensely colored, large blossoms. Each burgundy colored petal is edged with the thinnest strip of white, and this coloring causes the lily to produce a memorable presence in the garden. 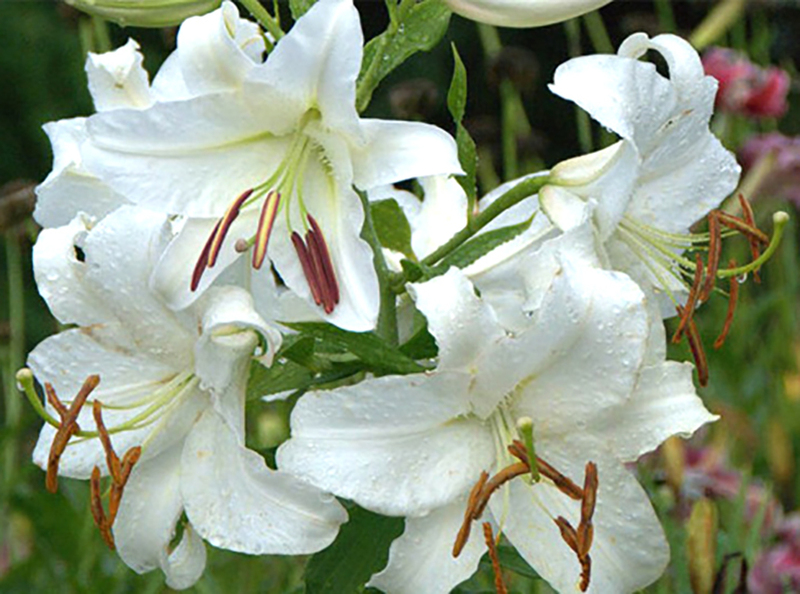 We have chosen Casa Blanca as a lily to grow with children because of its truly stunning fragrance. For teachers, unless you have year round schooling, liliesare not a good choice because they will bloom when your students are awayon summer vacation, but for parents and others, it is hard to find a betterflower to grow with children. 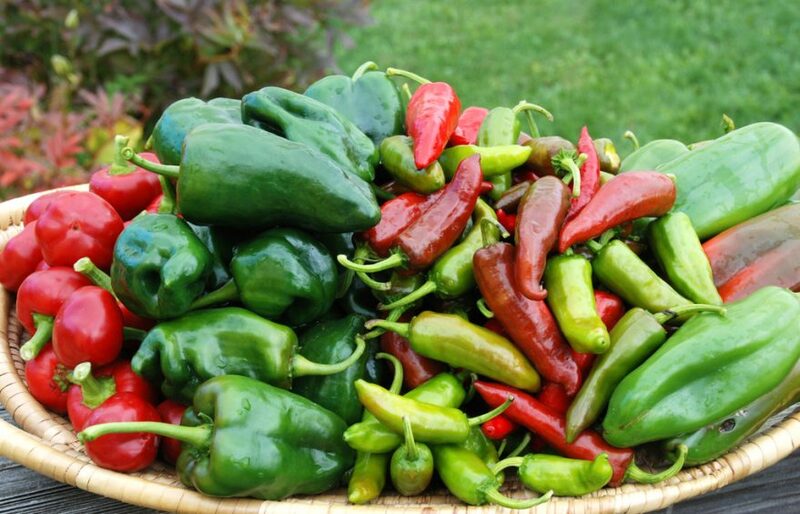 If grown in a pot (see instructions above), Casa Blancas will reach a height of3 feet. If grown in the ground, Casablancas will reach a height of 3-4 feet the first year and will eventually reach a height of 4-6 feet in 3-4 years. The plants produce a spire of crystal white blossoms: 3-5 in the first year and up to 8-12 eventually. Casablanca is a plant that will inspire the imagination of even the most intransigent child, and for those children who come to love gardening, the Casa Blanca lily will become a part of their gardens for the rest of their lives. There is no better, nor truer testimonial to lilies than this. and click on BLOGS located on the top menu. 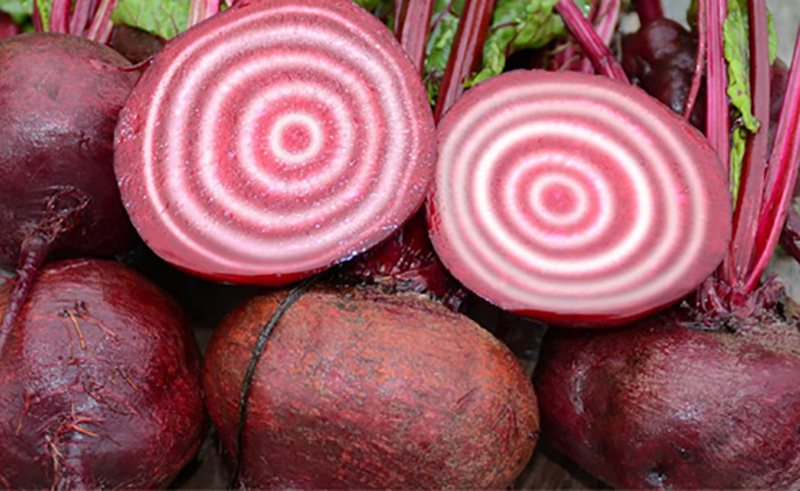 Don’t miss our Tuesday, 1-22-2019 newsletter on Beets.